The Greys. Vampires. Evil Psis. Better Bring a Spare Clip. Wrestle enraged gargoyles on rain-slick ledges high over dark city streets! Endure the rew psychic fury of the dreaded soul dog! Above all, watch out for the insidious Greys, as they kidnap human women and steer the destiny of entire nations! Our only defense against these terrifying foes is the Company, which takes conspiracy from theory to practice. As one of its best recruits, you'll endure five years at the hellish Academy, where only the best of the best graduate and failing grades become tombstone inscriptions. Upon becoming a black op, you'll possess attributes and deadly expertise to make mere normals tremble. You'll need them – because it's all true. Ancient alien visitors and recent arrivals, things slithering in sewers and alleys by night, dark plots by paranormal cabals to bend humanity to their will – all these dangers and more lurk in society's shadow. Experience GURPS as never before in Black Ops, an adventure setting that takes cinematic roleplaying to the edge and over the top! GURPS Basic Set, Third Edition is required to use this supplement in a GURPS campaign. GURPS Ultra-Tech is recommended. The setting described here can be adapted for any game system. 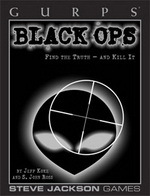 GURPS Black Ops: A Minor Emergency – Your team of Black Ops must track down two of your own. Have they gone over to the other side, or have they just snapped? Or is it something else entirely? 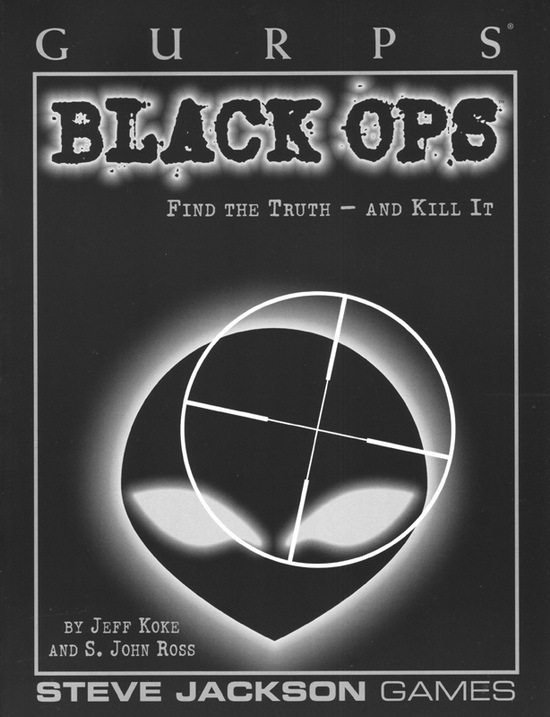 GURPS Illuminati – The Secret Masters have denied all knowledge of the various conspiracy theories put forth in this book.